For what it's worth, folks, this scribe's let life take precedence over work these last 24 hours... and, well, to say that being surrounded by every facet of my life in my town has been a beautiful, moving and happy experience doesn't begin to cut it. So to everyone who's braved our friendly local "police state" to be part of the moment, a lifetime's thanks – it's simply meant the world. And now, after a three year roller-coaster of waiting, planning and every emotion under the sun, it all comes down to this – before a crowd of at least half a million, the Pope's closing Mass of this eighth World Meeting of Families and his longest overseas trip to date on Philadelphia's Benjamin Franklin Parkway. Together with last night's address by Francis at a star-studded Festival of Families on the city's grand ceremonial boulevard (fullvid) – for which the Pope tossed aside his prepared text to give a sprawling, emotional half-hour reflection – the message Francis delivers at today's liturgy will likely serve to point squarely toward next Sunday in Rome, when the Vatican's main event of 2015, the climactic second part of the Synod of Bishops for the Family, opens with a sizable mandate to discuss possible changes to the church's pastoral care for families in challenging situations vis á vis church teaching. 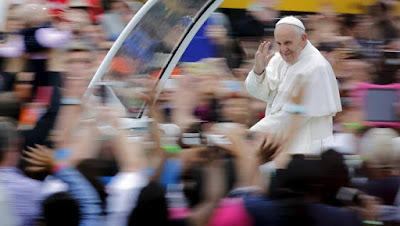 SVILUPPO: In a powerful preach – echoing an equally strong July message on the family in Latin America – Francis again urged the coming Synod to take up the challenge of not "being so narrow" and aim instead at "being open to miracles of love for the sake of all"... all without explicitly mentioning the coming assembly in Rome. Once we realize this, we can understand why Jesus’ words about causing “scandal” are so harsh. For Jesus, the truly “intolerable” scandal consists in everything that breaks down and destroys our trust in the working of the Spirit! Our Father will not be outdone in generosity and he continues to scatter seeds. He scatters the seeds of his presence in our world, for “love consists in this, not that we have loved God but that he loved us” first (1 Jn 4:10). That love gives us a profound certainty: we are sought by God; he waits for us. It is this confidence which makes disciples encourage, support and nurture the good things happening all around them. God wants all his children to take part in the feast of the Gospel. Jesus says, “Do not hold back anything that is good, instead help it to grow!” To raise doubts about the working of the Spirit, to give the impression that it cannot take place in those who are not “part of our group”, who are not “like us”, is a dangerous temptation. Not only does it block conversion to the faith; it is a perversion of faith! Faith opens a “window” to the presence and working of the Spirit. It shows us that, like happiness, holiness is always tied to little gestures. “Whoever gives you a cup of water in my name will not go unrewarded”, says Jesus (cf. Mk 9:41). These little gestures are those we learn at home, in the family; they get lost amid all the other things we do, yet they do make each day different. They are the quiet things done by mothers and grandmothers, by fathers and grandfathers, by children. They are little signs of tenderness, affection and compassion. Like the warm supper we look forward to at night, the early lunch awaiting someone who gets up early to go to work. Homely gestures. Like a blessing before we go to bed, or a hug after we return from a hard day’s work. Love is shown by little things, by attention to small daily signs which make us feel at home. Faith grows when it is lived and shaped by love. That is why our families, our homes, are true domestic churches. They are the right place for faith to become life, and life to become faith. So we might ask ourselves: How are we trying to live this way in our homes, in our societies? What kind of world do we want to leave to our children (cf. Laudato Si’, 160)? We cannot answer these questions alone, by ourselves. It is the Spirit who challenges us to respond as part of the great human family. Our common house can no longer tolerate sterile divisions. The urgent challenge of protecting our home includes the effort to bring the entire human family together in the pursuit of a sustainable and integral development, for we know that things can change (cf. ibid., 13). May our children find in us models and incentives to communion! May our children find in us men and women capable of joining others in bringing to full flower all the good seeds which the Father has sown! Pointedly, yet affectionately, Jesus tells us: “If you, who are evil, know how to give good gifts to your children, how much more will the heavenly Father give the Holy Spirit to those who ask him!” (Lk 11:13). How much wisdom there is in these few words! It is true that, as far as goodness and purity of heart are concerned, we human beings don’t have much to show! But Jesus knows that, where children are concerned, we are capable of boundless generosity. So he reassures us: if only we have faith, the Father will give us his Spirit. Anyone who wants to bring into this world a family which teaches children to be excited by every gesture aimed at overcoming evil – a family which shows that the Spirit is alive and at work – will encounter our gratitude and our appreciation. Whatever the family, people, region, or religion to which they belong!